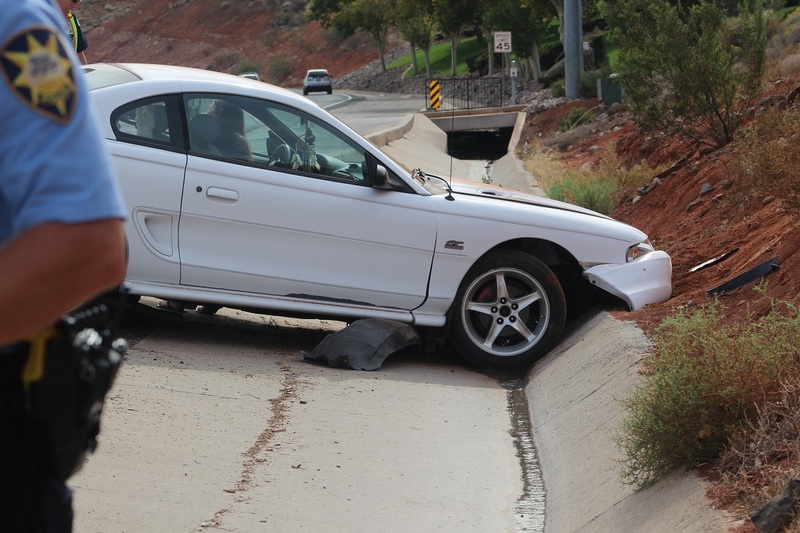 ST. GEORGE – A vehicle careened across four lanes of traffic and just missed an oncoming truck before hitting a cement barrier and plowing about 10 feet up a dirt embankment on Bluff Street Thursday afternoon. 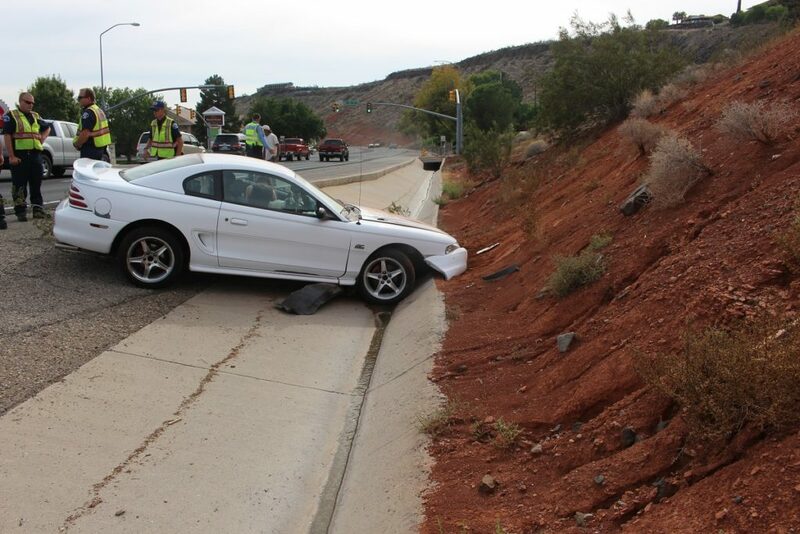 Just after 1 p.m. officers and emergency personnel were dispatched to Bluff Street on a single car crash reported just north of 100 South, St. George Police traffic Sgt. Craig Harding said. 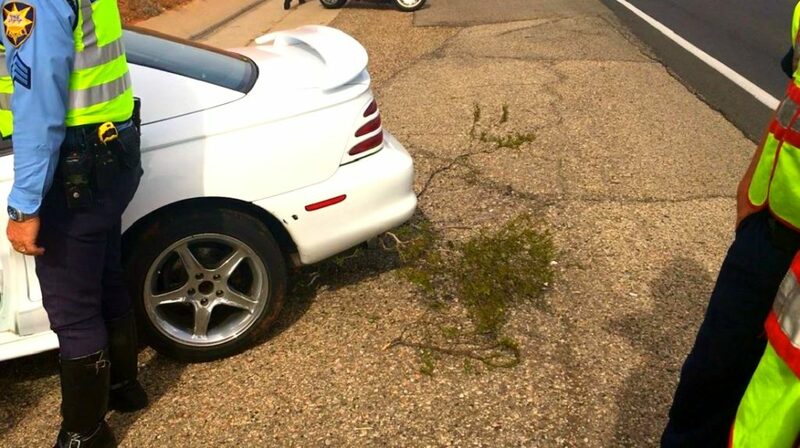 Upon arrival officers found a white Ford Mustang crushed into the embankment on the west side of the street, with tire tracks clearly visible more than 10-feet above the area where the car came to rest, Harding said. The woman told officers she was heading north on Bluff in the outside lane and reached for her cell phone. Once her eyes left the road she veered to the right and hit the curb, which according to the driver sent the vehicle careening to the left. The car continued through all four lanes of traffic, Harding said, narrowly missing a head on collision with a pickup truck heading toward her. 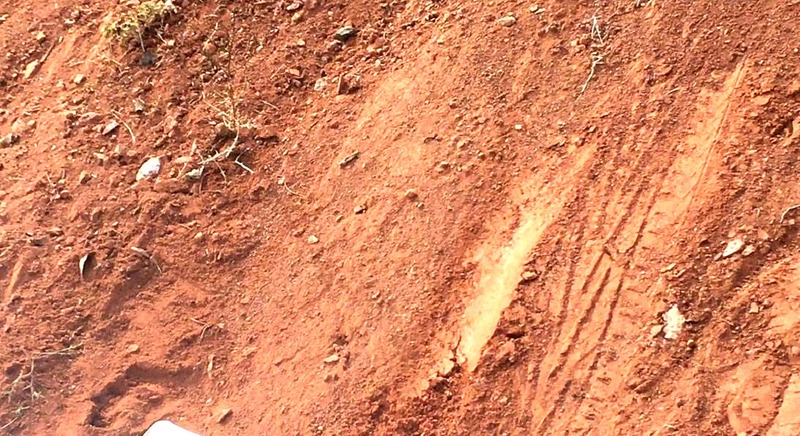 The car then hit the embankment with enough force to launch the vehicle more than 10 feet up the cliff, before it crashed back onto the ground where officers found it. Officers at the scene found that the driver was alcohol restricted, refused to cooperate with the officer’s request to submit to a field sobriety test or breathalyzer, Harding said, and was driving without a breathalyzer operating in the vehicle, which is required. The driver was subsequently arrested at the scene, and once she was medically cleared the woman was transported and booked into the Washington County Purgatory Correctional Facility. The vehicle was impounded subsequent to the woman’s arrest and was towed from the scene. Harding also cautioned drivers of the dangers of distracted driving. Whether this driver was distracted by a cell phone or possibly impaired, or both, he said, the fact remains that distractions cause crashes – period. Editor’s note: This incident occurred near 100 South on Bluff Street. The story was updated at 11:03 p.m. to reflect a corrected address. Mr Reporter; do you mean “just north of 100 SOUTH” on Bluff Street? I thought so. Thank you very much for your comment. The crash location in the story has been updated with its correct address. 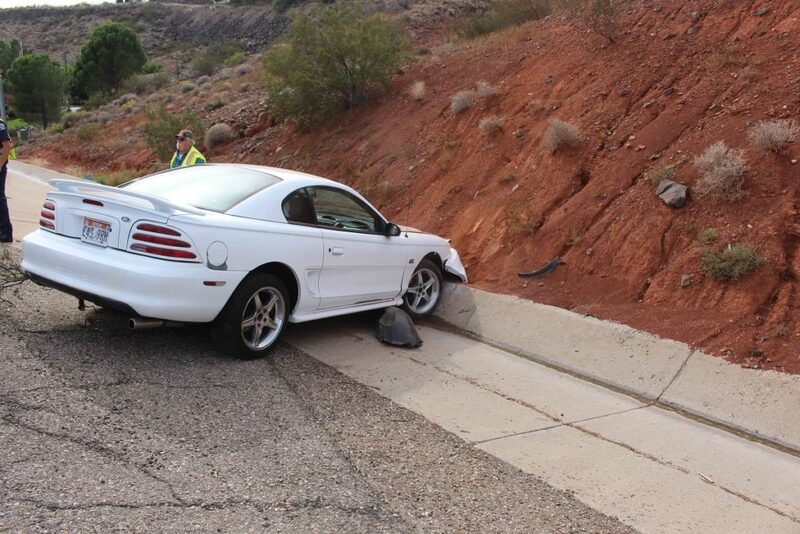 Thanks again for reading and being an active participant in St. George News! Us, the public, are lucky she missed our cars. Bad and way too dangerous situation. This is great news. now Dumbob and Cry Baby Low Life can pay for her confinement and food and clothing and medical and her rehab and her court appointed attorney with their tax dollars ! Pills were probably involved. Is she any relation to Brother Dumpster?